Attractive leather megillah case, which holds the scroll of Esther. 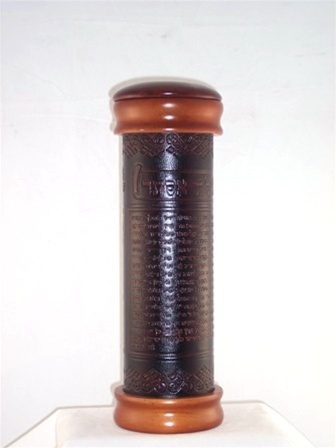 The mahogany case is covered with magnificent embossed leather, and includes a key passage from the megillah. The case is lined with velvet on the inside. The smaller case will accomodate a megillah of up to 12 inches; and the larger case will hold any megillah up to 16 inches.